Readers of The Monday Box may have noticed that I haven’t posted an addition to my Military Care Package series since August. There is a wonderful reason. Right as I began baking for a September care package, Paratrooper Derik sent me a facebook message with great news. His deployment ended and he was heading home! After expressing how happy I was for him, and thanking him one last time for his service, I asked Derik for a small favor. My request was that he find a new recipient for future Monday Box Military Care Packages. These Honey Graham Sandwich Cookies were baked for my new friend Soldier B. The week 3 theme for Cookie Month ’14 is Cookies for Gifting. I shipped off several gift boxes of pretty little Honey Graham Sandwich Cookies. Note that “honey” is the first word in this cookie’s name. Chewy-crunchy grahams are bursting with honey flavor. The toasty whole wheat taste is a great match for the sweet honey. They are satisfying to munch on their own. By adding a thin layer of chocolate between two grahams, and a seasonally shaped cut-out on top, these sturdy snackables turn into festive giftables. 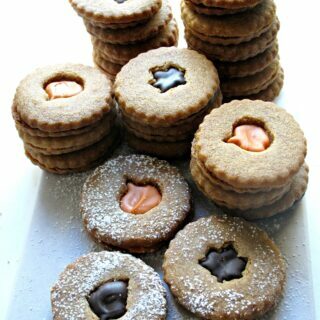 I used Chocoley dark chocolate (candy molding formula) for half of the Honey Graham Sandwich Cookies. It’s just so easy to work with and tastes so good. 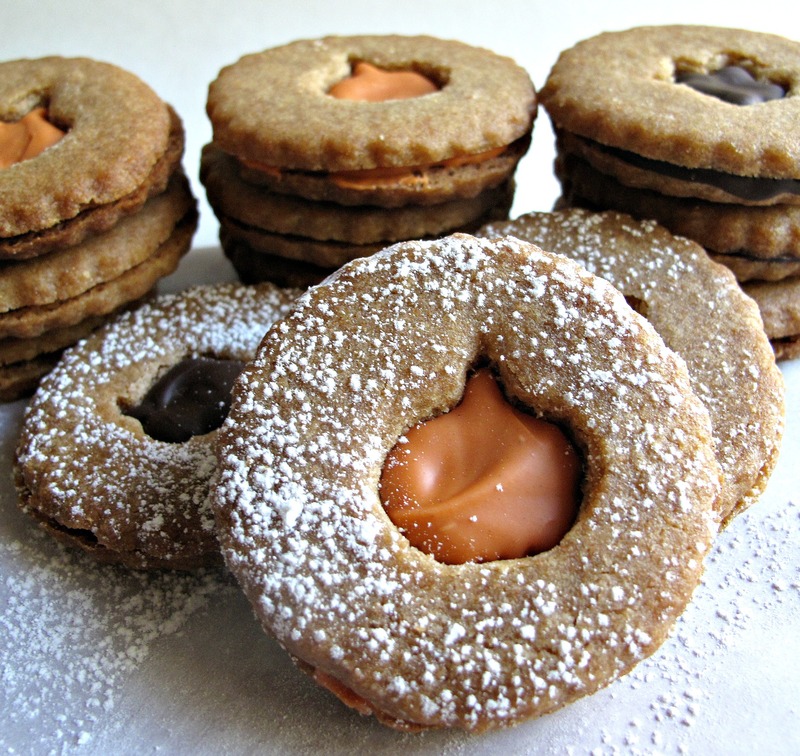 The other half of the cookies are filled with orange Wilton Limited Edition Pumpkin Spice Candy Melts. If you like pumpkin spice, I strongly suggest you find a bag of these candy melts before they disappear. The flavor and color are just right for Halloween or Thanksgiving baking. As I packed the Honey Graham Sandwich Cookies into Wilton gift bags for shipping, I began thinking of the many possible uses for the colorful little bundles. In addition to being perfect gifts for teachers, hair stylists, neighbors, and party hosts, I thought the cookie bags would look festive at place settings on a holiday table. My batch of Honey Graham Sandwich Cookies bound for Afghanistan were double wrapped in plastic wrap before popping them in gift bags and nestling them securely next to the rest of the care package goodies. Part 1 Care Package Contents: The obvious choice of theme for October is Halloween. I have been told that, starting at the end of October, the weather is safe for sending chocolate (and other things that melt) to Afghanistan. If not, my new friend will be getting a care package full of snack size chocolate syrup. I hope he won’t be too polite to tell me if that happens, so that I can improve with care package practice. 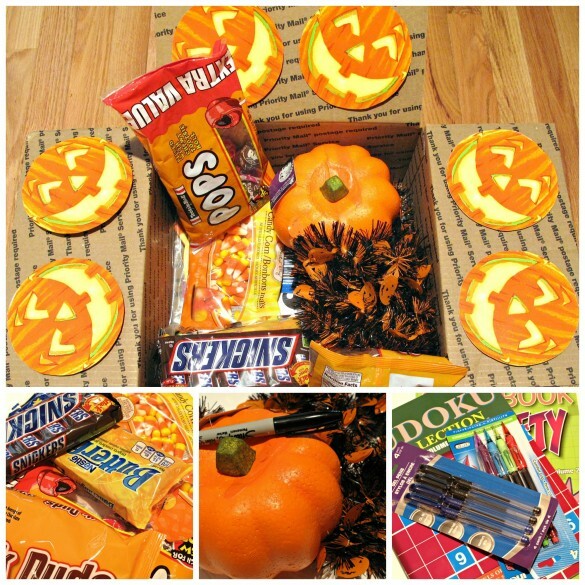 This Halloween box is filled with candy, decorations (I love the Styrofoam pumpkin), and a few puzzle books. There wasn’t room for any Monday Box goodies, other than all the cookies, so I scrapped plans to include Candy Bar Blondies, which would have been perfect with the Halloween theme. Part 2 Circle Sugar Cookies: There are so many adorable decorated Halloween cookies on Pinterest, that it was hard to decide what to try. My criteria are fun, festive, and easy to do for beginners like me. I think these simple Halloween mummy and pumpkin designs are just what I was looking for. The mummies don’t even require food coloring! As usual, I used the vanilla and chocolate sugar cookie recipes from Lilaloa (one batch each) and faux royal icing from Bakingdom . (The same sugar cookies I used for my Birthday Cake Cookies and Snowmen and my previous circle cookie adventures.) One batch of faux royal icing was enough for two dozen cookies. 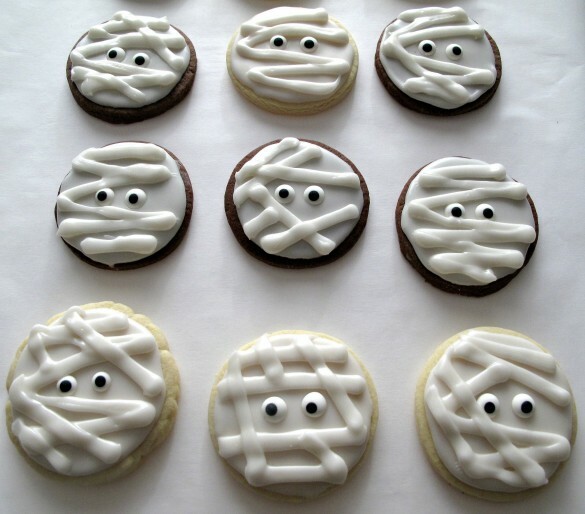 For the mummies, I spread white icing onto the cookies with a knife. The little eyes (purchased at a craft or cake decorating store) are added while the icing is wet. After allowing the surface to dry for 2 hours, ribbons of icing are piped over the mummy face. The cookies should be allowed to dry completely overnight before packaging. For the pumpkins, I used food coloring to tint a small amount of icing green for the stems and colored the rest of the icing orange. I found it easiest to pipe the orange icing onto the cookie in a shape like a rounded heart. Unfortunately, when it came to the stems, I had already completed most of the cookies when I discovered the stem method I ended up liking best. For most of the cookies I waited until the orange icing had set slightly then I piped on small stems. I was going for “easy” but they were a little too plain. What I tried and really liked, was adding the green stem immediately after piping on the orange icing, then using a toothpick to gently drag a few thin lines of green onto the orange. It looks more like a real pumpkin stem that way. Or maybe it looks like an orange tomato. 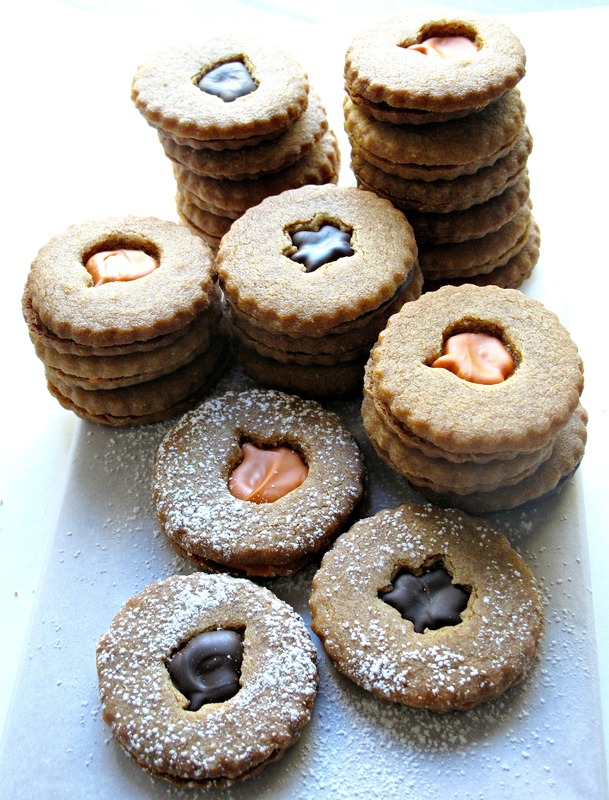 Part 3 New Recipe: Honey Graham Sandwich Cookies are good shipping cookies as well as good cookies for gifting. The recipe works equally well with vegetable shortening (Crisco) or butter. Grahams are easy to make and even easier to eat. Wrapped and mailed in an airtight container or zip lock bag, they will stay fresh for at least one week. Baking Note: It is not a mistake. The cookies are all baked without a cut-out. Dough with cut-outs is hard to move onto a baking sheet without smushing the inside shape. Also, dough that contains leavening, in this case baking powder, puffs slightly during baking, further distorting a center cut-out. 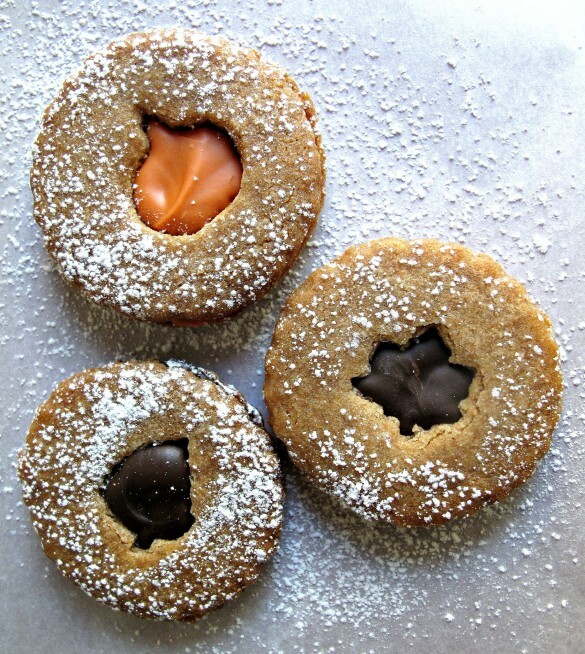 The shapes are cut from half of the cookies shortly after coming out of the oven, while the centers are still warm and soft. In the bowl of an electric mixer, cream together shortening/butter, brown sugar, and honey. Roll out dough between sheets of parchment or waxed paper to 1/8” thickness. Cut out shapes (circle, square, oval, rectangle) with 2 ½” cookie cutter and place on the prepared baking sheet about 1” apart. Bake for 7-9 minutes or until edges are firm. Allow to cool on the baking sheet until just cool enough to touch, about 2-3 minutes, then use a mini cookie cutter to cut shapes out of the center of half of the cookies. These will be used as the top cookies for the sandwiches. Cool on the baking sheet for 5-10 minutes before transferring to a wire rack to cool. When the cookies are completely cool, melt the chocolate or candy discs in the microwave or over a double boiler. Flip over the solid cookies (without cut-outs) so that the bottom is facing up. Spread about ½ teaspoon of the filling onto a solid cookie not quiet to the edge. Gently press a cut-out cookie on top. Place the filled sandwiches on a baking pan, and refrigerate for 5-10 minutes or until the filling is set. Double wrap pairs of cookies (with bottoms together) in plastic wrap, then place in an airtight container or zip lock bag. Due to the filling, these sandwich cookies should be shipped only during cool weather. 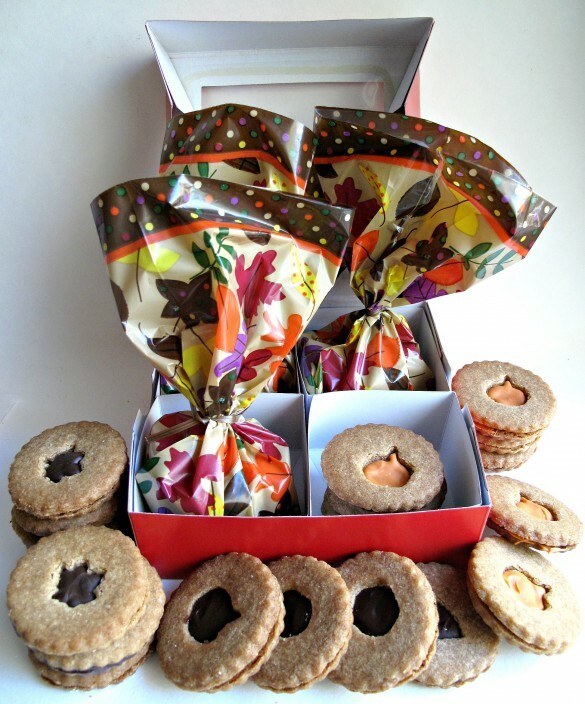 The individual graham cookies without filling can be mailed year round. What a wonderful idea! 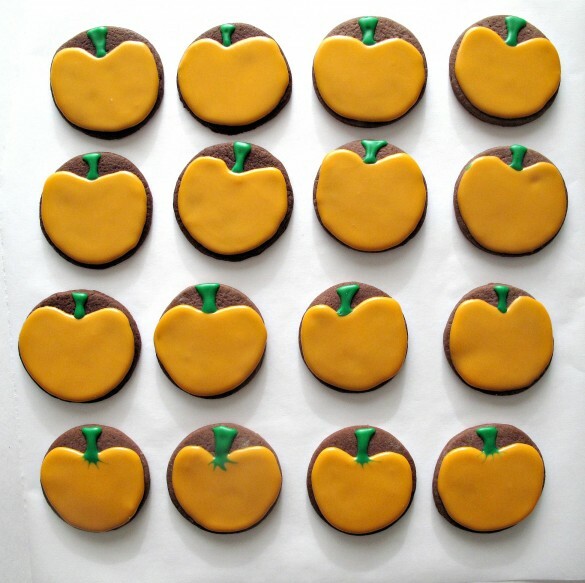 They must love getting homemade stuff – especially yummy cookies like these! Who wouldn’t love to receive a package like this Wendy? Your cookies are beautiful, can’t decide which I like best although those sandwich cookies are definitely calling my name! Wendy, you are so inspiring! These military care packages are wonderful — thank you for supporting our troops and for sharing such delicious cookies! Thank you, Chelsey! If you like the flavor of honey grahams, you will love these! Thanks for pinning! Thanks, Jess! (Love the new gravatar photo! Now you aren’t hidden under a hat! I need to get my act together and get a photo up on the blog!) I hope the cookies traveled well and that the soldier will let me know! I’m so glad that he found you a new recipient for your packages! I absolutely love that you do this 🙂 All these cookies look fantastic – love those mummies! These are awesome and sooooo unique! The pumpkin cookies are CUTE !! My Granddaughter’s husband is currently deployed and I sent her over to your site to get some idea’s for cookies and packing. She is not a blogger and didn’t leave a comment, but wanted me to thank you for all the great ideas! Thanks so much for sharing with us at Full Plate Thursday. Have a great weekend and come back soon! The purpose that motivates me to keep plugging away at this blog, is to help make care packages (especially military care packages) as delicious as possible. Thank you SO much, Miz Helen, for sharing The Monday Box with your granddaughter and for letting me know that she enjoyed what she found here!! Please let her know that I offer her and her husband my heart felt thanks for their sacrifices and service to our country! Also, thank you for the warm and welcoming potluck that you call Full Plate Thursday! 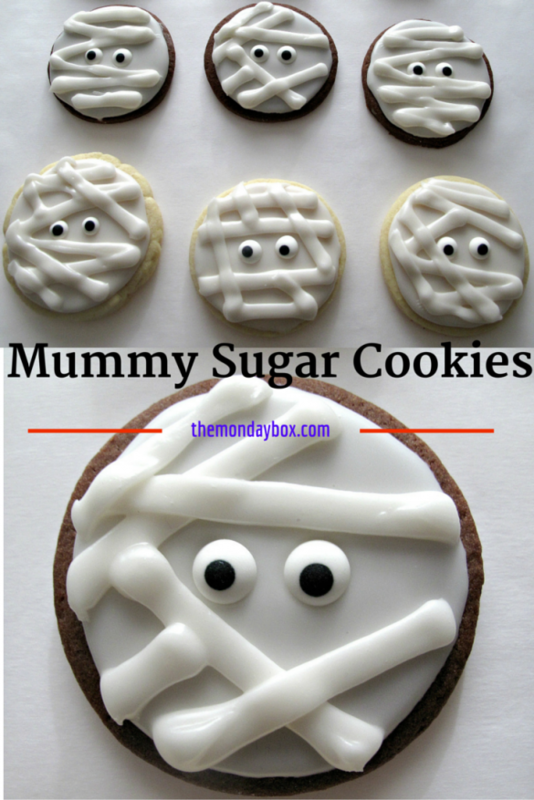 These cookies look too cute to eat especially those little mummies! Thanks, Kate! Thanks also for hosting Merry Monday! I love them, Wendy! I would have thought they’d be more complicated just because they’re so gorgeous! Thanks for sharing with us at Throwback Thursday! Thank you, Meena! Have you checked out the military care package ideas and recipes on The Monday Box? I know that packages to ships can take a LONG time to arrive and I have a number of recipes (search shortbread and biscotti) that are perfect for Navy care packages! Thank you to your family for your service to our country! Those all look so good! but…I LOVE the mummy ones! How adorable. And delicious. Thank you, Swathi! i appreciate your sharing and your hosting!! I love that you send care packages to the military like this – what a wonderful thing to do. I will have to see if there’s a similar program in the UK. 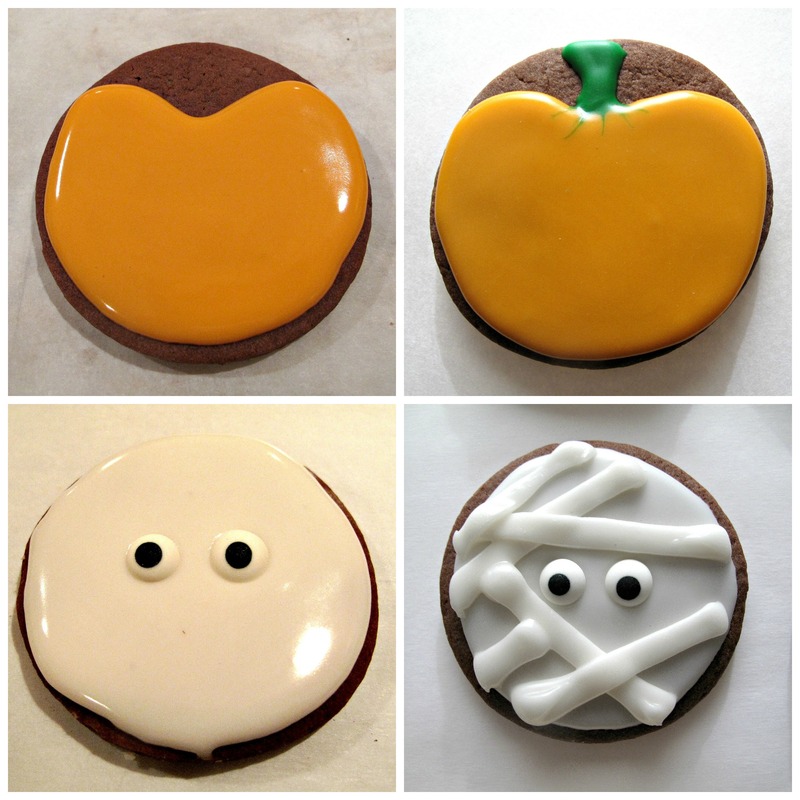 Your cookies all look wonderful – I love how you have decorated them – especially the cute mummies! Pinned. Thank you for sharing with us at Hearth and Soul. Hope to ‘see’ you again this week! So nice that one deployment ended, and it’s lovely you are sending a taste of home to Soldier B now. What a fantastic selection of treats, Wendy! Love these honey graham sandwich cookies, not least of all as we can’t get graham crackers easily in the UK. 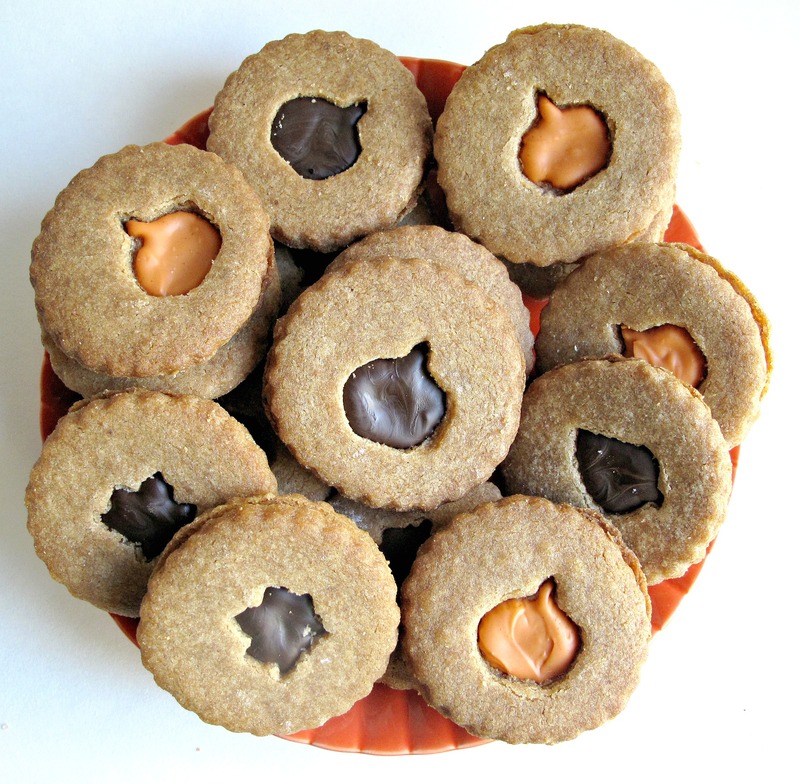 These are much nicer than the boxed ones – and I love the fun Halloween fillings too! Pinning and sharing. Thank you so much for your support of the Hearth and Soul Link Party!